For more than 100 years Memorial Day weekend in Indianapolis has hosted the Indianapolis 500. Hundreds of thousands of race fans and competitors from around the globe visit the “city of speed” for one of the greatest spectacles in motorsports. This year the Indy 500 fans weren’t the only ones enjoying high horsepower. 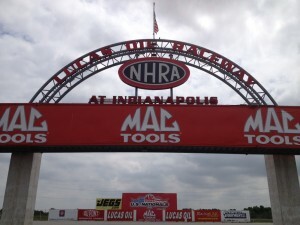 Frank Hawley’s Drag Racing School made a trip to Lucas Oil Raceway Park just a short drive from the famed oval. “This is an exciting time of year to be in Indy. The entire city is revved up and talking about racing.” said Hawley. “We had a terrific group of drivers this week . The track was great and the cars were flying.” Hawley continued. In the group of drivers that were ‘flying’ down the track were Stan Johnson and his two sons Eric and Perry. “I started drag racing in 1958 with a front engine dragster we built entirely from junkyard parts.” Said Stan. “The chassis was built from black iron pipe and I ended up running 112 mph in that thing. It didn’t take long before I wanted to go faster. I was working as an industrial designer and drew up some plans for a streamlined dragster that we eventually built. With an injected engine we got it over 160 mph.” said Stan. Stan’s love of fast cars remained with him over the years and took him from road racing to the salt flats. However his love of drag racing never left him. Growing up around the race tracks it seemed likely that his sons Eric and Perry would ‘catch the bug’ and they too started to race. “We wanted to get the proper training and that was at Frank Hawley’s.” added Eric. “The program that Frank put together is excellent. Reading the written materials and watching the video he provided helped so much. The first few runs are really fast but after a while you kind of settle in, things slow down a bit and you can really enjoy the ride.” said Eric. You can come and experience the fun, challenge and excitement behind the wheel at Frank Hawley’s Drag Racing School. The School offers classes throughout the year and across the U.S. For complete details on dates and locations, contact Frank Hawley’s Drag Racing School by calling 866-480-7223 [Outside the U.S. 678-804-8835], online www.frankhawley.com. Also look for the school on Facebook, Twitter, Instagram and YouTube.